For Christmas 2014, we wanted to mix up our Christmas cookie, but just a little bit. Each year for the holidays, we’ve done a chocolate-based cookie: mint chocolate chip, chocolate gingerbread, chocolate snickerdoodles, you get the point. This year, the chocolate is not only in the cookie but also in the form of a kiss (awwww). You may be familiar with the traditional peanut butter cookie that features a Reese’s Cup or a Hershey’s Kiss in the middle. Well, we found a recipe for a red velvet cookie and had to try a variation of it because, well, it’s red velvet. Yum. 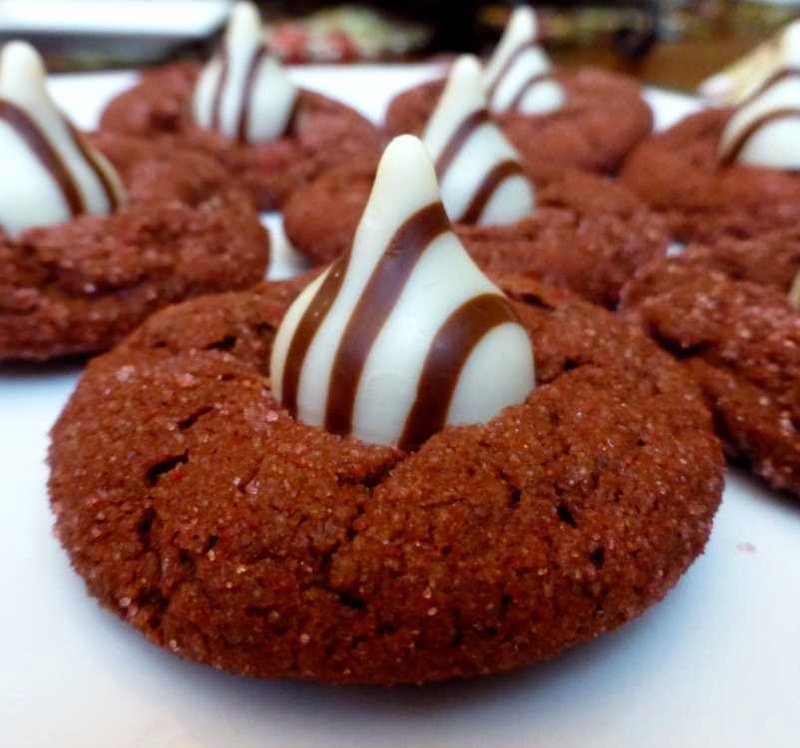 So here is our version of the Red Velvet Kiss Cookie, actually a kiss and hug since it uses Hershey’s Hugs (milk chocolate Hershey Kisses covered in white chocolate). It’s such a sweet little cookie. 1. In a large mixing bowl, mix butter with brown sugar until blended well, and then add egg, vanilla and red food coloring one at a time until well blended. 2. In a medium bowl, combine flour, cocoa powder, baking soda, salt and baking powder (we sift them all together). 3. Add flour mixture to butter mixture and mix well. If your dough is sticky, refrigerate for 30 minutes to an hour — you don’t want it sticking to your hands for the next step. 4. Put red tinted sugar in a small bowl. Roll dough into balls and roll them around in the tinted sugar until well coated. 5. Place cookies on cookie sheet and bake for 10-12 minutes. Do not overbake or else they’ll be too hard. 6. When you take the cookies out of the oven, let sit for 1-2 minutes and then transfer to cooling rack. Immediately place one hug (kiss) into the center of the cookie and press in gently. Let cool. If you place the hugs (kisses) into the cookies too soon after they come out of the oven, the hugs (kisses) will melt and you’ll have Salvador Dali versions of this cookie. This entry was posted in Recipes and tagged cookies, Recipes by Inn on Mill Creek. Bookmark the permalink.